It was an odd, yet unquestionably puzzling way that I discovered I had been fired. When the January 2015 Goodguys Gazette arrived and my name was gone from the masthead, a spot it been for more than 12 years, I finally got the message. My Fuel For Thought column and the occasional special features and photos were history. Emails had gone unanswered for months and phone calls were never returned. I should be livid, but I am only saddened by the reality that the one place the land speed racing community could count on reading something monthly about their marvelous motorsport in a national publication was no more. God Bless ‘em — Goodguys published every one of them in their entirety. I didn’t think my cold dismissal could be about money because I hadn’t asked for one raise in 12 years. Of the 150 stories about land speed racing for the Gazette, a good number of my columns won international writing and photographic awards from the Society of Automotive Historians (SAH), All American Racing Writers and Broadcasters Association (AARWBA), Motor Press Guild (MPG), International Automotive Media Competition (IAMC). In 2009, Goodguys named me “Woman of the Year” and presented me with a fabulous hand-crafted piece from artist extraordinaire, the late bob McCoy. Because so many land speed racers, enthusiasts, family and friends have told me the only reason they became members of the Goodguys was to get the publication that contained my Fuel For Thought column, I am obliged to inform you of this odd and awkward development. Perhaps you have come to value more than just my writing and will continue to subscribe, but now you have the facts to decide what is best for your reading pleasure. Please don’t ask me for the “back story” when you see me, I simply don’t know anymore than I have written here. The ones who have, “the rest of the story” (tip-o-hat to Mr. Harvey) are VP of Media Travis Weeks and Editor John Drummond and they aren’t talking – to me at least. Below is a letter one loyal reader sent to the publication in response to dumping FUEL FOR THOUGHT. It is letters like this that warm this writer’s heart to know the work is appreciated and ignites inspiration to stay the course in the future. 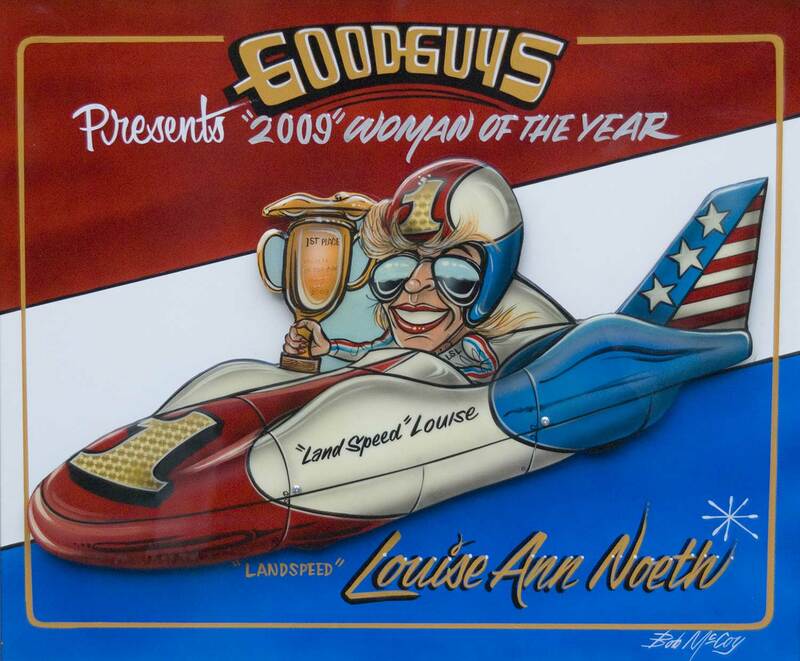 I was very disturbed to learn that the Goodguys Gazette will no longer publish “Fuel For Thought” prepared by Louise Noeth (Landspeed Louise). When my magazine arrives, hers is the first article I read, long before checking the monthly editorial, or gazing at page after page of advertisements. Not only can she keep her readers in touch with latest news in the land speed world but she also tells the readers the history of land speed racing. Louise has helped bring a whole new generation to the sport of high speed world records. She has also encouraged many of us to visit the salt and to participate. You have done a great disservice by eliminating her articles. She is a valuable resource and not someone to be eliminated on the spur of the moment. Her tireless dedication to the sport is unmatched. History is very important to us as a country and also to us in our sports. To appreciate what we have today we must study our past. The history of motor sports is directly tied to land speed records and racing. 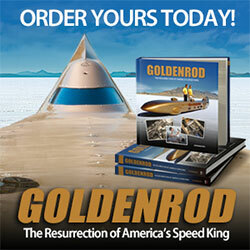 The dry lakes of southern California brought us today’s hot rods, landspeed racing, and drag racing. The beaches of Florida brought us early high speed records and the foundation for NASCAR and the Daytona Speedway. This racing heritage is the foundation for the hot rods that you write articles about, photograph, and promote events. Frequently Louise writes about our racing history. Much of this could be lost without her efforts to keep it alive and recorded. Please reconsider your decision to eliminate Landspeed Louise from your magazine. One of my readers brought to my attention that my very last published piece in the Gazette also carried a public declaration of unwavering support from the editor that I have linked below (Click on GG_Spangler). This was part of the “letters to the editor” called “Rodders Respond” that appears monthly. The letter was written by veteran land speed record holder Dave Spangler, the current driver of TEAMVesco’s Turbinator II, that is seeking to exceed 500MPH on the Bonneville Salt Flats this racing season. Upon reflection, the actions of the Association and publication staff reinforces my long-held work ethic of, “trust, but verify”. . .